As an adult, there are moments when we watch a children’s film and are incredibly touched by its message. I’m sure most of you know what I mean – with many movies we watch, we tend to apply our own life’s situations to the message presented in a film and if we’re lucky that message will touch us hopefully in a positive way, make us think, and inspire us. This was the case when I recently took my babies to see the movie Brave. Like almost every princess since time began, the lead character, Merida, wants to pick her own husband in her own time, thus creating a widening rift with her tradition-adherent, overbearing mother. Our heroine naturally befriends a comical witch/wood carver, complete with a long nose and boiling caldron in her enchanted shop located just past Stonehenge-like rocks deep in the dark forest. Merida hands over a valuable amulet in exchange for a spell that will change her destiny and she thinks will free her from her mother’s tyranny. True to all life lessons presented in Disney-esque movies, she should be careful what she wishes for! Merida ends up on a race to reverse the spell, save her mother and restore peace to the divided kingdom – and of course learns a big lesson along the way. The best part is that not only does she learn a valuable lesson for herself, but she opens the minds of her family and the kingdom, teaching them all a valuable lesson. 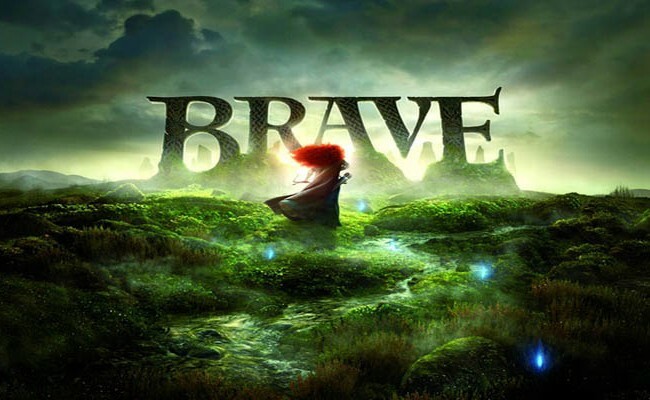 In my opinion Brave doesn’t quite live up to the overall class of excellence as Pixar’s classics like Up, WALL-E and Finding Nemo, but that certainly doesn’t mean that I did not thoroughly enjoy the movie and take its special message to heart. 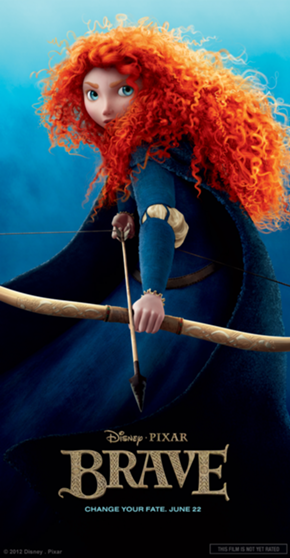 In Brave, our girl Merida is determined to carve her own path in life by defying an age old custom. She confronts tradition and challenges her fate to change her destiny. 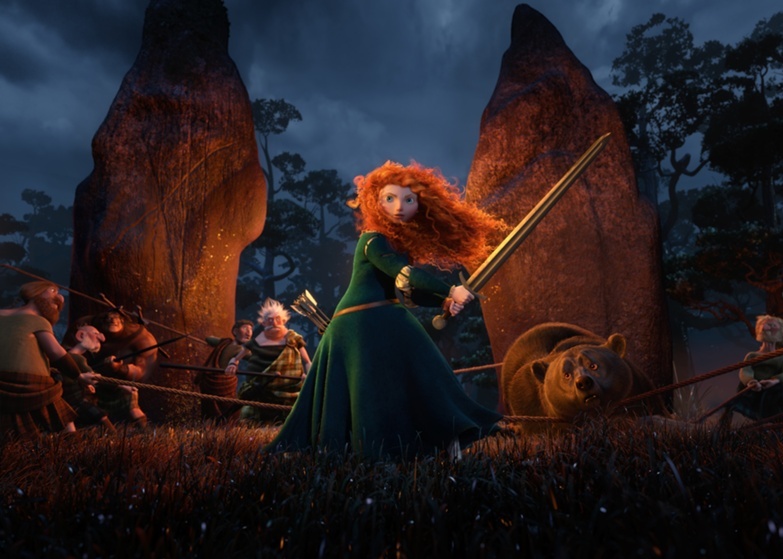 Her actions inadvertently unleash chaos and fury in the kingdom and the ensuing peril forces Merida to harness all of her skills and resources, discovering the true meaning of bravery. Merida doesn’t give in to the pressures of her society and goes for what she wants in her life, even though at first everyone thinks she’s crazy. Along the way, she opens the eyes of those she loves and an incredible bond and appreciation grows between her and her mother as they learn from each other. In time, she realizes that despite her mother’s ways, her mother is and has always been there for her. I don’t know about you, but I think way too many of us give in to the pressures of society and let go of our own happiness because we’re too afraid of what others may think. We let others dictate our fate instead of choosing our own and following our true destiny. It’s never an easy thing to do and it certainly comes with its pitfalls and tough lessons – heaven forbid life ever be easy! But, when you look back at your life, wouldn’t you rather know that you gave your own destiny a chance, took risks and reached out for what makes you happy, instead of letting it be squashed and decided for you? I think we can learn a lot from our fiery red headed friend, Princess Merida. Two messages I personally took from this special film are 1) to constantly reassure my precious children that I am always here for them, no matter what, and 2) the importance of creating my own fate and following my own destiny. The way I see it, life is too short! Are you willing to sacrifice your happiness and allow your true destiny to be smothered? Or in this short life, will you be brave and dictate your own fate as you reach for your destiny? This entry was posted in Activities, Advice, Children, Columbia, Famously Hot, Lexington, Lexington Medical Center, Midlands, Parenting, Shannon Boatwright, Women and tagged Brave, Columbia, columbia sc, Disney Films, every woman blog, Famously Hot, hospital blog, Lexington, lexington medical center., lexington sc, Lexington Women, lmc, LMC every woman blogger, Midlands, Midlands Women, shannon shull, South Carolina, South Carolina Women, Women, women's blog, women's hospital blog by Ashley Andrews. Bookmark the permalink.